What does Alfred Lord Tennyson’s Charge of the Light Brigade have to do with neoclassical equitation and Baucherism in the United States? Surprisingly, more than nothing. 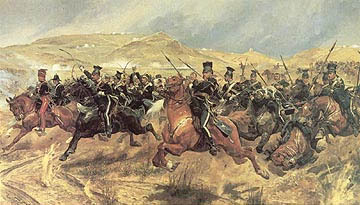 Charge of the Light Brigade illustrated what can go wrong in society and in war when hierarchies form as the result of an aristocracy versus a meritocracy, and also commented on the value of accurate communication and forethought during the fog of war. As an English major, I could add some things. I really don’t have a dog in the fight, however: sooner or later, in my observation, hierarchies are unavoidable, and all kinds ultimately turn into the same basic thing: “haves” exploiting “have-nots” in the interest of retaining and getting more of what both groups really want, which is more power, fame, and money. All good things, of course, and not really news to thinking people. Here’s why the poem matters, and how it relates to Baucherist methods: In the actual historical battle rode a particularly enthusiastic and skilled horseman named Captain Louis Nolan. For a gentleman of only 37, he had some very strong and forward thinking views on the training and effective use of cavalry. Following his father before him, he was pursuing a promising military career. On October 25, 1854, he likely envisioned some great and future glory as his unit rolled into a charge against an impossible entrenchment of Russian soldiers. Fate and Russian artillery would intervene, however, sending him instantly from this world to the next, even before he could fall off his horse. He was the very first of his unit to die. Prior to this fateful day, however, he’d invested much time and energy reviewing the cavalry practices of Europe at the time – specifically, the best approaches for training troopers, and, moreover, methods for training their horses. His research culminated in a book published in 1852 entitled Training for Cavalry Horses. Now, even though Nolan was himself widely recognized as an especially gifted horseman, and even though he had now exposed himself to virtually every basic method in practice at the time, he attributed everything of value in the book to one man: Francois Baucher. In fact, he initially had intended a simple translation of Baucher’s New Method from French to English, but became concerned too much would be lost in a direct translation, given subtle differences in the meanings of words, phrases, etc. He therefore made some modifications to the arrangement of Baucher’s published work, and, in some cases, tried to simplify it for use in educating cavalry troopers, who, by and large, are beginning with very little knowledge, and, of course, will not be expected to bring their horses to high school airs. Since this book was put in the printer’s hands, I have been travelling on the Continent. Everywhere I found that Monsieur Baucher’s new Methode had excited much attention, and not a little jealousy amongst the followers of the old system. Books and pamphlets have been published, trying to turn into ridicule the bold intruder, who, in two months brings his horses to do what years could not accomplish in the old school. In France, Baucher’s Methode was subjected to a trial, which, according to the reports of many members of the committee, was eminently successful. 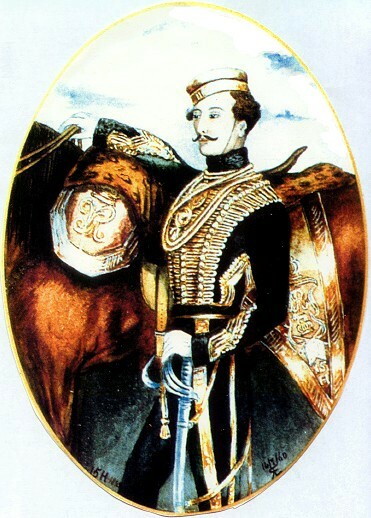 The system was rejected notwithstanding; but some of the bending lessons – the most important part of his methode – were retained, and are now made use of in the French cavalry. 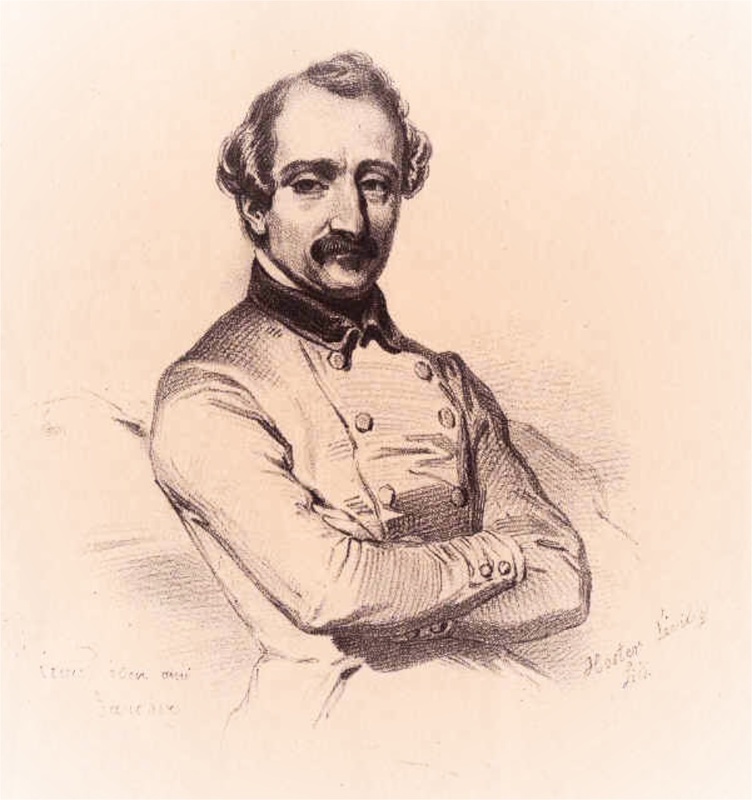 In what I have seen in the different foreign riding-schools which I have visited, I have found no reason to change my opinion regarding the advantages to be derived from the application of part of Monsieur Baucher’s Methode, to the purposes of cavalry; and I have endeavored to take from both systems what I found best in practice, namely, from the old system, the principle of first bringing out the horse’s action, improving his paces, giving power and freedom to his movements; and from Monsieur Baucher’s, those lessons which enable us to control that action, and thus regulate the horse’s paces, and render him handy and obedient. This “System for Training Cavalry Horses,” is based upon the principles of equitation discovered by Monsieur Baucher, of France, and originally arranged by Captain S. E. Nolan 15th Hussars, English Army. For the plates illustrating the following pages, the author is indebted to the skill and kindness of Captain W. H. Bell, 3d Infantry. West Point, October 1st, 1861. 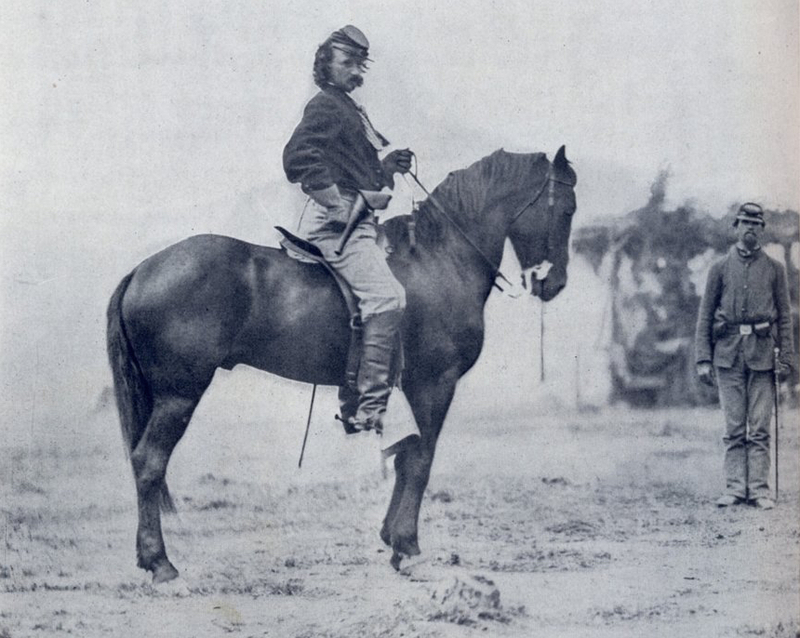 To further demonstrate the point, let’s consider the subsequently improved and clearly Baucherized West Point horsemanship by considering one of its very worst (and most famous) cadets: George Armstrong Custer. Here he is, having recently graduated at the bottom of his class at West Point (a year early – along with his peers – in order to fight in the Civil War). Though he graduated at the bottom of his class, he was widely esteemed as the best horseman. As pictured below, the educated eye will observe Custer presenting his horse perfectly immobilized, in hand, neck raised with poll at the highest point, and the distinctive ramener produced by Francois Baucher’s ‘New Method’. He does this in the classical manner – much as Newcastle, Guérinière, or Baucher would have: with one hand operating a single bit – the curb (with it’s S-shaped shanks, it might be marketed as an “academic” bit today). This position, I assure you, does not happen on its own with any horse. It is the result of extensive and correct training of a particular style – perhaps rarer now in the US than then – but unusual enough to be distinctive in either time. So there we have it. Baucherism had made its way to the United States even before Baucher’s death (1873), being adopted by the US Cavalry, while being – for all intents and purposes – officially rejected by the French Cavalry Baucher had worked so tirelessly to persuade. Ironically – and unfortunately – the nation who initially gave “Baucherist dressage” its most enthusiastic and official welcome in the 19th century is undoubtedly least familiar with his ideas today.